It’s a requirement for survival in today’s hyper-competitive marketplace. Not surprisingly, businesses of all scales – from start-ups to corporations – spend great capital and focus on increasing innovation in their organizations. Whether it’s disruptive innovation that changes the marketplace entirely, or incremental innovation that improves one product from another competitors’ offerings – innovation is fuel in the business world. In order to best instill an innovative culture, companies should consider the design of their office spaces and how they’re engineered to naturally spur the type of creative thinking that can turn an idea into a scalable innovation. It’s not enough to simply find an empty room and re-name it a think tank, incubator or hackerspace. Energizing the innovative spirit in an organization via design requires concrete strategies and intentional efforts – and there’s no one-size-fits-all solution. Here’s a look at three industries that can teach any organization a thing or two about catalyzing innovation. Every successful entrepreneur knows the best ideas are rarely found while staring at a computer, checking e-mails or in between meetings with Finance and HR. Creative energy often finds us while out for a run, over a drink with friends or even late at night when we can’t sleep. Organizations need to find a way to ensure their people can channel their creative energy anytime, anywhere. Lassonde Studios at the University of Utah, a first-of-its-kind education facility that merges a residence hall with an entrepreneurial garage, fully embraces this idea. Students living in Lassonde Studios have 24/7 access to 3Dprinters, prototype labs, co-working space and a slew of technology. If students wake up at 3 a.m. with a new concept, they can walk downstairs and begin ideating. They live, create and launch all in one space. To be clear, I’m not suggesting emerging companies should ask their employees to live at the office. But companies do need to ensure they offer a continuum of workplace and IT infrastructure that empowers their people to connect anytime. The last thing organizations want to have happen is to lose new ideas simply because an employee can’t log in and access company tools from home. Moreover, organizations need to recognize that flexible schedules and cultures of wellness are good things for creative energy. A mid-day run does more than just help the employee get away from the workplace. It may set off a creative spark. The best way to find breakthrough ideas is not to lock oneself in a room and stay there until you’ve covered a wall in sticky notes. Game-changing ideas are often the result of ongoing brainstorming and collaboration driven by multiple teams and individuals. New science facilities like the Gates Vascular Institute and Clinical Translational Research Center (GVI/CTRC) in Buffalo, NY are designed to empower this radical caliber of idea-sharing. The academic medical center stacks a research building on top of a vascular institute and connects them with a collaborative core to enhance partnerships and innovation. The collaborative core contains education and conference spaces, along with a 4,000 sf business incubator that allows doctors, researchers and entrepreneurs to meet in a variety of dynamic situations to accelerate and commercialize medical discoveries. This culture of collaboration is enhanced further by open-plan laboratories that allow for increased flexibility, adaptability and innovation. While not every company is looking to build a massive hospital-like facility, the same principles can apply to smaller workplaces. It’s key that start-up spaces are designed to bri ng people together, not separate them. Creative ideas from one department can inform efforts in another and someone’s crazy idea might be the solution a different team needs. This doesn’t mean eliminating every wall in the workplace, but it does suggest organizations need to seek out workplace solutions that purposely bring people together, knock down traditional silos and encourage collaboration to achieve new ideas for business success. People often find their best ideas when they’re allowed to put different pieces together, try, modify, tweak and try again. 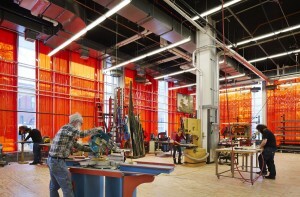 The new Theater School at DePaul University welcomes this notion by providing expansive shop spaces for costume, makeup, prop and scene shops, rehearsal studios, lighting laboratories, movement studios, etc. where students and actors are encouraged to let their imaginations run wild. All the tools and props they might require are placed along the walls of the shops and there are no set rules for how they need to be used or arranged. Instead, the entire space is an open canvas where these artists can work together to find creative solutions. 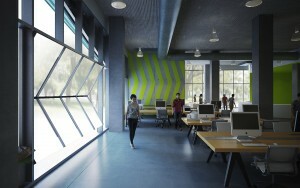 This is another ideal organizations can infuse into their workplaces. Rather than view the workplace as a place where prescriptive actions happen in set areas and specific people sit in the same place every day, it is okay to dedicate spaces where employees can arrange technology, furniture and lighting as they see fit for different activities. It’s okay to let employees sit and work amidst different people or departments for different efforts. This workplace freedom increases employee satisfaction and allows them to be more comfortable and creative each day. Ultimately, start-ups and emerging companies rely on creativity and innovation to push forward. 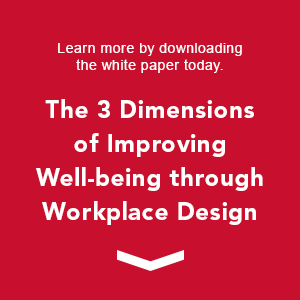 Organizations seeking to thrive in today’s knowledge economy need to ensure their workplaces are set up to help their employees innovate the key ideas that lead to differentiation and growth.